I posted ‘My Best Chocolate Chip Cookie – and it’s GF’ not too long ago. You know what’s coming, now don’t you? I was wrong. I have a new best, although this is just an adaptation of the old best…… These are my best-est, BFF-est chocolate chip cookies – in fact they are right up there with my best cookies ever and are indeed GF, so the whole family is very excited about these cookies, and dang it, they are almost gone. I hate it when everybody loves the cookies! But what is not to love? 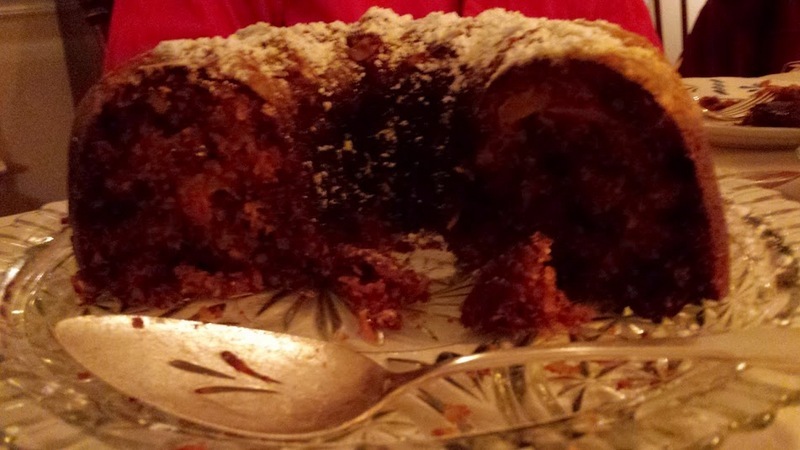 A little crispy on the outside – chewy on the inside, chocolate… do I need to go on? Seriously, these are good cookies. 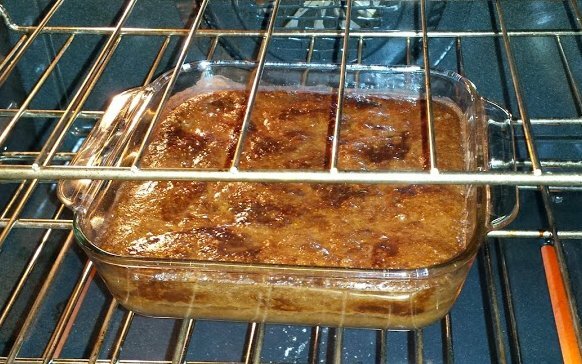 Bake for 12-14 minutes, rotating halfway through until browning just a tad on the bottom. Mine puffed up slightly and then started to deflate. That’s when I took them out. And if you’d like some more chocolate chip recipes…. we happen to have a few others. Did She Say Chickpeas & Chocolate? Enjoy your chocolate chips when they roll or drop your way and come back and visit us soon. I was going to leave the title as just ‘Shepherd’s Pizza’ thinking it might intrigue millions, or thousands of readers into opening this post. Then I thought perhaps I’d better offer just a little explanation, or maybe nobody would read it except for my mother. So now that you are here…. you are still perhaps wanting a little more explanation? This started as an attempt on my part to create a pizza crust out of potatoes (and a few other things). Well, it did not turn out to be something that you could pick up. More specifically, not pick up and take a bite that was several inches away from where you were holding it. You could pick this food up in your hands if you are so moved, however…. it won’t be pretty. So, I would be happy to share Pastore Potato Pizza with you! 1/2 cup cashews that have been soaked in 1 cup water for at least 6 hours and then drained. – Drain the cashews and blend or process with the yeast flakes, milk and olive oil until fairly creamy. – Place everything, including the blender goo in a large bowl and mash away. – Place parchment paper on a pan or two and spread a layer about 1/4 -1/2 inch thick on the parchment paper. – Bake for 20 – 30 minutes. I left one in for 20 and one in for 25. Neither burned but the one in longer started to get a little puffy. It might be good to leave them in longer but I don’t think they will ever get dry enough to be crusty and I didn’t notice much difference at the end either. – Top with your choice of stuff and pop back in to heat up the toppings. I did not put raw veggies on top as I was afraid the sweating of those veggies would make the whole thing too soupy. 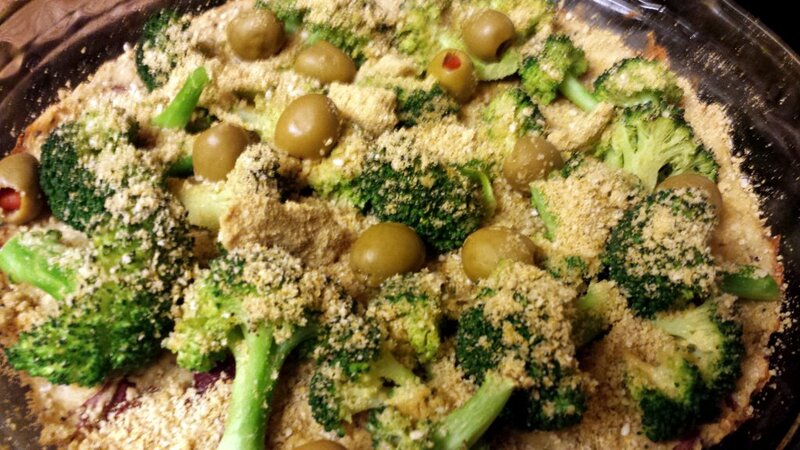 The other I brushed with olive oil, sprinkled on slightly steamed broccoli, green olives and vegan parmesan. Of course my son wouldn’t touch this one, but it was my favorite. 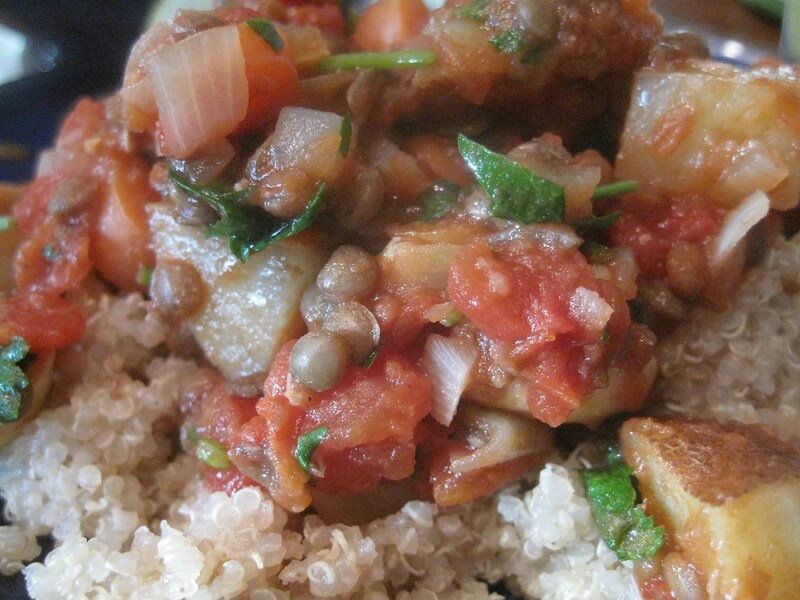 A switch from flour or grain based dishes. Some favorite flavors. 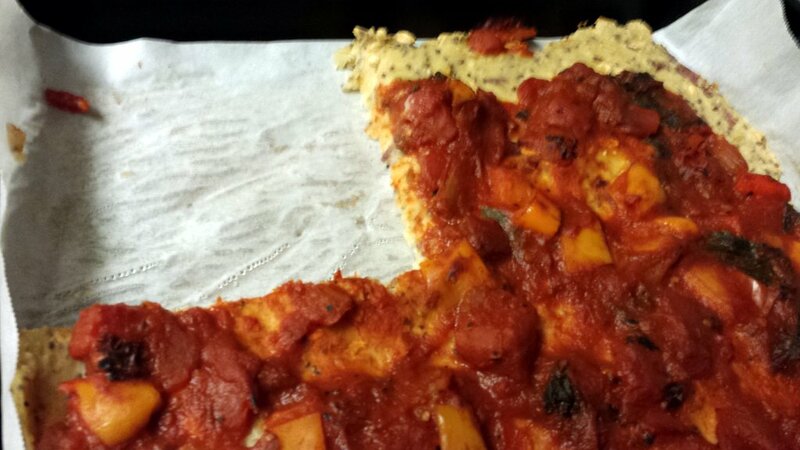 Overall a failed crust with a happy ending! Thinking of planting potatoes this year? Little Sis has had luck with this method. Other potato dishes? 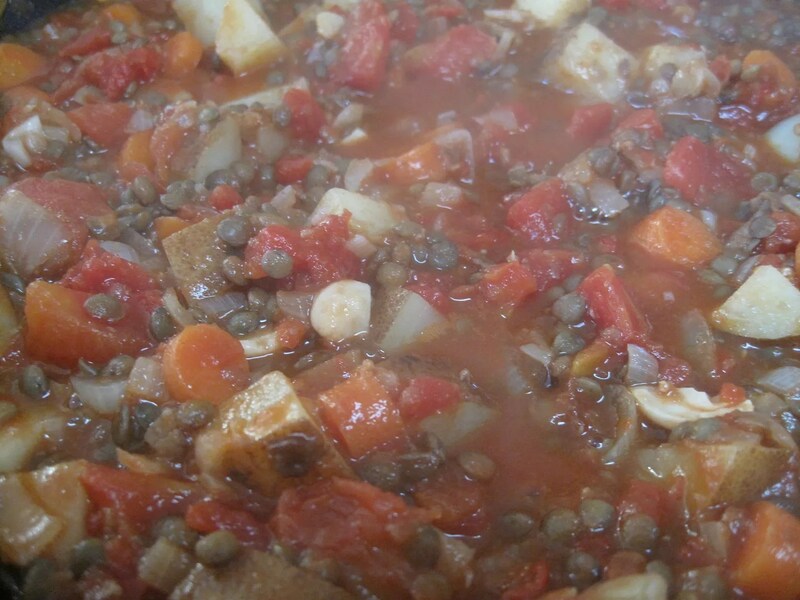 We’ve got ’em…..
Once in awhile we post someone else’s recipe as is – unchanged. I confess that part of my just taking the easy road and making this by actually following directions was that I was in a hurry. You see I had to come up with some GF dessert that would make non-GF son feel like his birthday had been adequately celebrated. Following Little Sis’ lead (see another birthday cake for Bigg Sis), I turned to Angela Liddon. It is always an honor to point anyone in the direction of Angela Liddon who has a blog and a lovely cookbook that features vegan recipes. I do believe that her specialty is sweets. In fact she had a shop where she sold amazing vegan bars and baked goods before becoming a successful blogger and cookbook author. Give this to-die-for fudgy mocha pudding cake a try and then buy her cookbook because the non-sweets in it are excellent as well! Back to the cake….. Last night we celebrated our boy, well, young man’s 14th birthday with a bunch of his friends playing football, video games, eating pizza and I’m ashamed to say, a store bought cake. Mr. Bigg Sis and I ate some and made yucky faces at the overly sweet, oddly gummy concoction with way too much icing. I vowed to do better the next night when the 3 of us would celebrate family style. 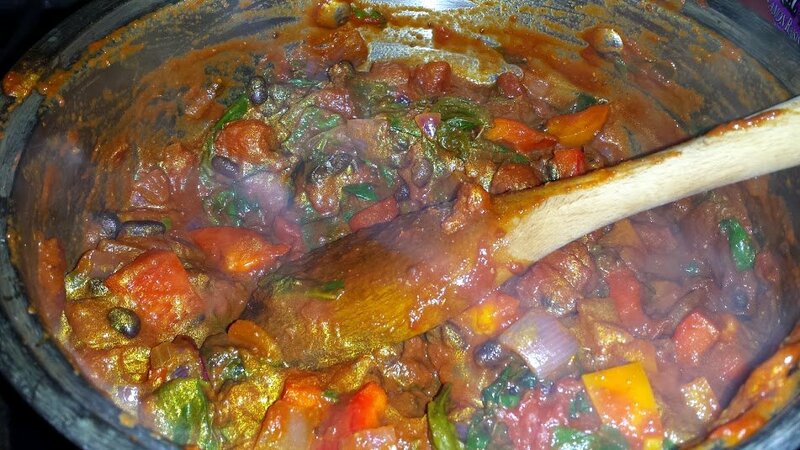 The headache that came soon after (yes, I am a sensitive and delicate creature for sure) was also good motivation to get my tail up and cooking the next day. So here is the recipe – totally ripped off but heartily acknowledged. Bake for 27 – 33 minutes or until semi-firm on top and bubbly on the sides – mine was a tad overdone at 27 minutes, so check at 25. Let cool for 5 – 10 minutes and then top if you like with sugar, walnuts or ice cream of your choice. 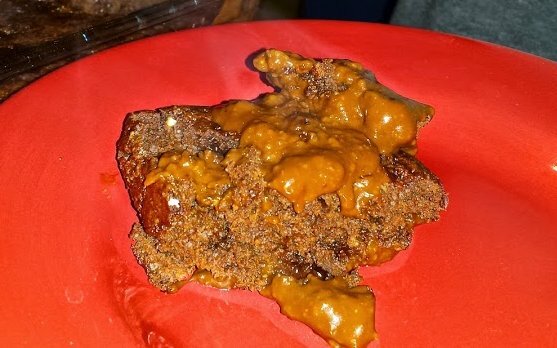 Now this may not look that good, but appreciate the consistency of the pudding like stuff that comes out with the cakey-like stuff. Really quite something. Everyone had seconds. In fact I’m still full….. no room for the snack I usually eat at bedtime to prevent waking up at 2 am so hungry I have to go get a snack. Okay, so I’m a rather ravenous but sensitive and delicate creature…. but I know a good real food GF cake when I eat one! 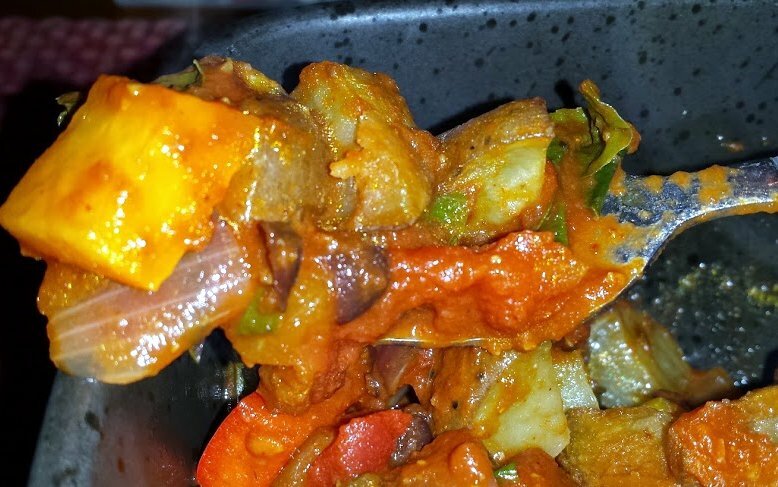 I am still on a quest to share uses for Tabil spice mix with the world – particularly the subset to whom I gave home roasted Tabil as a Christmas gift. The presence of cumin and red pepper flakes speak to chili, and the rest of the tabil ingredients (coriander, caraway and garlic) seemed different enough to twist the chili up a bit. I also thought that a different base than rice would be nice. We do fall back on rice a lot around here, and although I’m glad to have it (and my son could probably eat it 3 times a day), nutritionally speaking, variety is indeed a spicy and healthy thing. Enter the much maligned potato. Potatoes have been bred into giant, dry, starchy behemoths that are meant to be smothered in fattening dairy products. 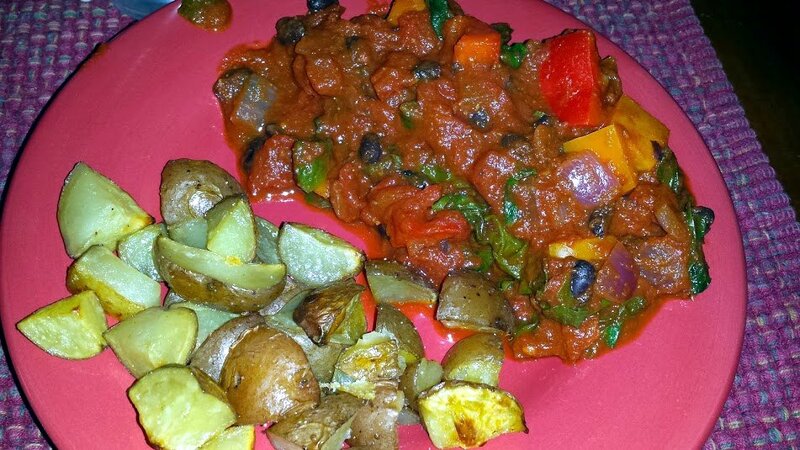 However, the little colored potato with all of it’s positive nutritional status is turning up in all kinds of places. I recently got 5 lbs. of organic little red taters for 4.99. That’s cheaper than the rice I use. Woo hoo! I’m thinking that all of you are as ready for simple as I at this time of year, and the Tabil helps keep this simple. If you don’t have any Tabil, it is pretty easy to make* and once you have it…. next time will be really easy! (Or you can buy it here). 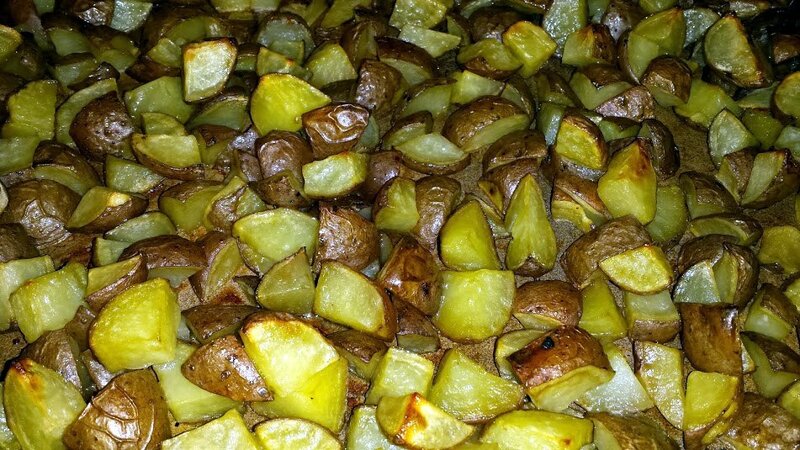 If roasting potatoes does not seem simple, then by all means make some rice – but the rest of this recipe is really quick and easy. Either toss it all in a bowl with oil to coat (I prefer avocado because it withstands high heat), or just stir oil in right on the roasting pan. Add some salt to taste and stick in the oven. Stir after 15 or 20 minutes. The peppers were crunchy, everything else soft and spicy. We all enjoyed this very much. My son, who is a charter member of the no-food-touching club chose to eat his potatoes on the side. My husband and I mixed it all together and then argued – gently discussed – who would get the leftovers for lunch. I won! Stay warm friends – soon it will be time for seed catalogs and dreaming of warmer days. For now, I’ll try to heat up my insides a bit with food and laughter. In addition – we are starting a new series on Well-Being which Little Sis opened a week or so ago. I’ll be posting the second soon. 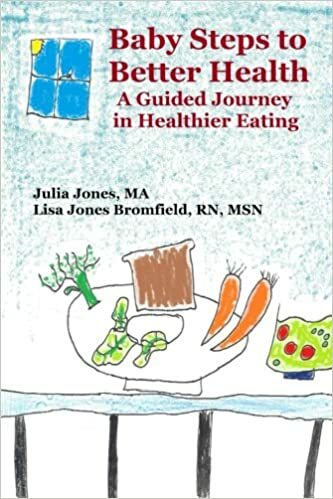 If you or someone you know is wanting to eat better and feel better check out our e-book, Baby Steps to Better Health: Winning the Battle with Junk Food for Families and Individuals. I love for my son to have a bunch of friends over to eat pizza and play games. But I don’t like eating a bunch of pizza – and my husband cannot eat a bunch of pizza, so while the kids were racing Kartts around the track (4 people / 4 corners of the screen – how DO they do that!? 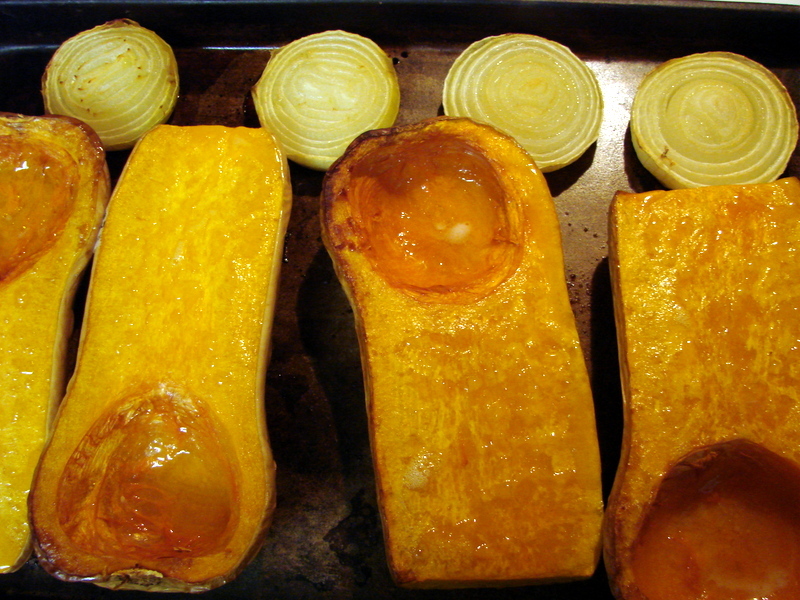 ), the kitchen was filling with the enticing aroma of roasting butternut squash, onions and garlic. This is not a new combo around here. 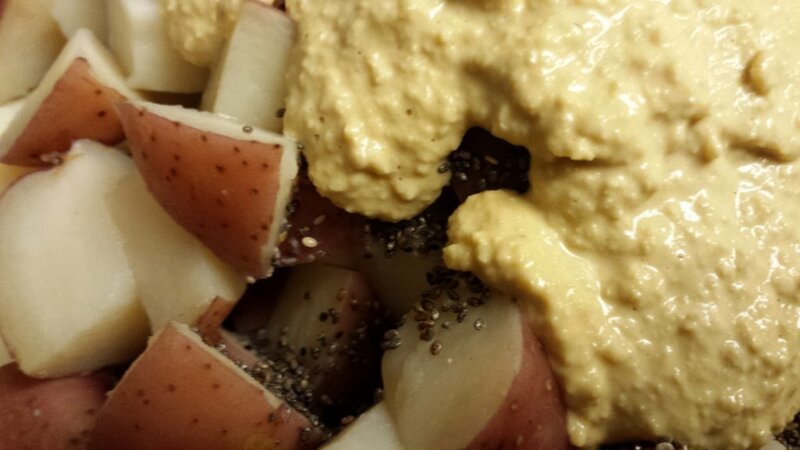 In fact I posted a recipe for such a concoction that includes walnuts and red potatoes from an original made with pasta a parmesan, but I decided to try using my parmesan substitute made from sesame seeds, sunflower seeds, nutritional yeast flakes and salt and we were both very pleased with the results. See how pleased we were? This is actually a picture from the post that includes the walnuts – back in my young and frivolous days when I had time to draw with a sharpie on the outer layer of a perfectly good onion. Ah youth! But seriously – this is an easy fix and ’tis the season to pick up some squash for a little less. 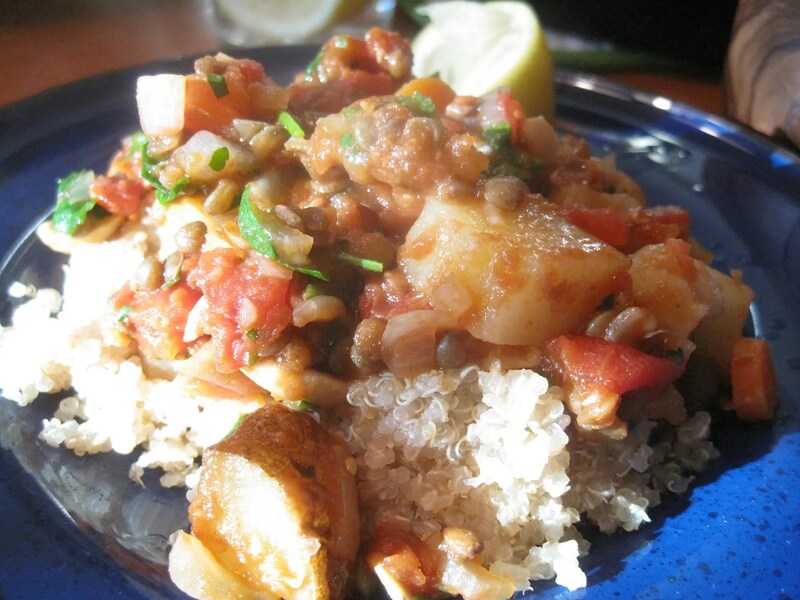 The recipe is on the small side – enough for a good meal for 2 plus a large leftover lunch. I’ll pick up a couple of squashes next time! 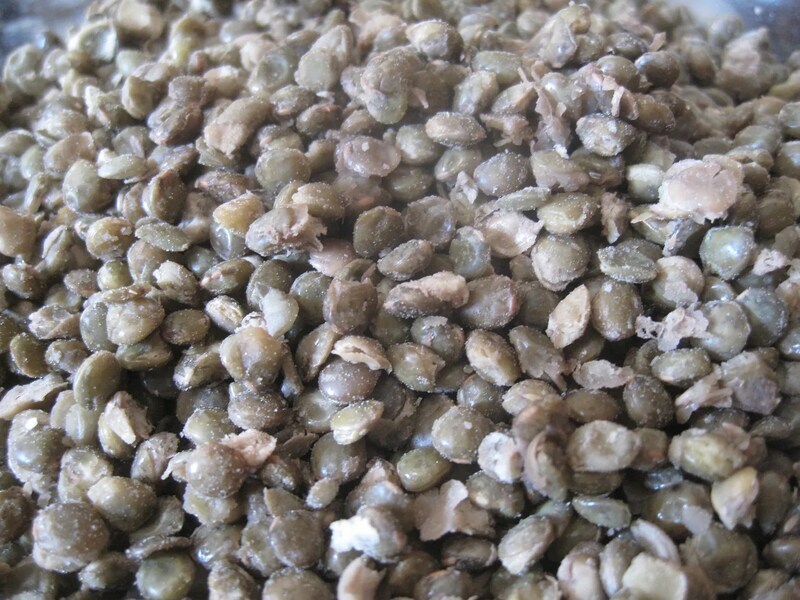 Blend until powdery – don’t go too long or the sunflower seeds will start to turn into sunflower butter! 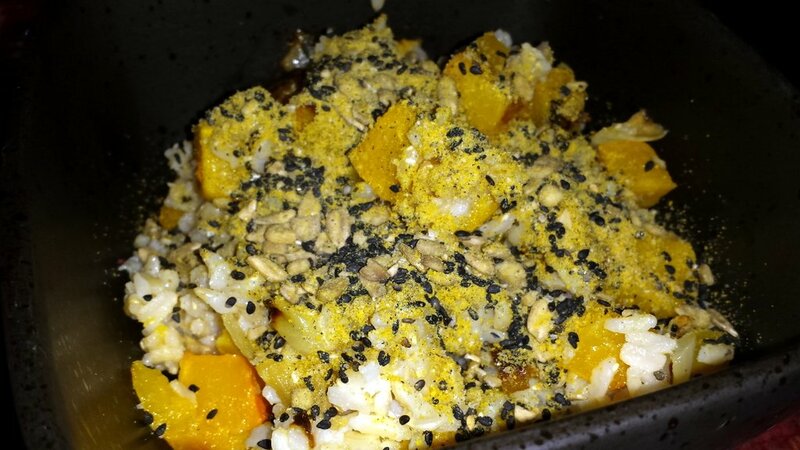 Place rice in a bowl, top with squash mixture and ‘parm’ to taste. My parm has black specks because I used black sesame seeds. I also didn’t grind the parm long enough because there are intact sunflower seeds. 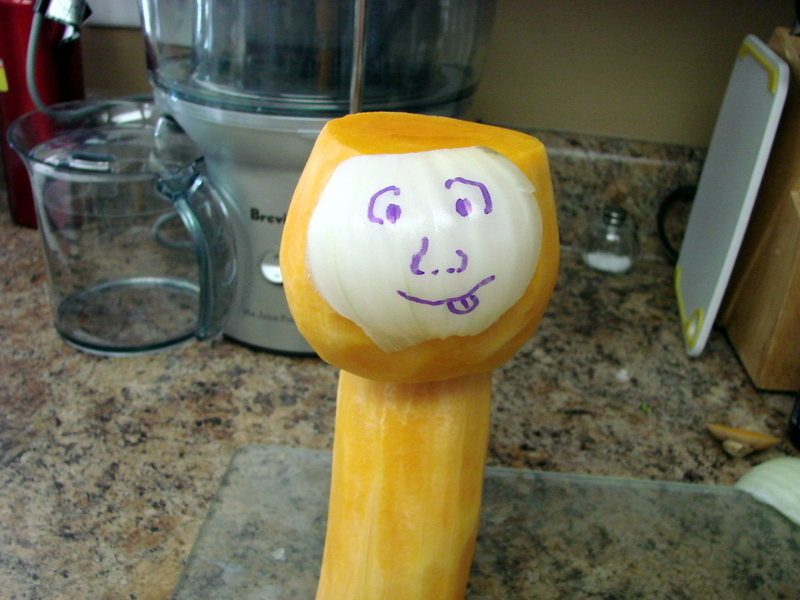 Yikes – how did I have time to draw on vegetables in the past, now I don’t even have time to grind the sunflower seeds? Ah well – it still tasted terrific. We have a new series starting this year on wellness. Check out Little Sis’ first post in this series…. 2015: A Year of Well Being We’ll be adding to this as the year moves along – and it will, probably blindingly fast at times. May we all pay enough attention to see the beauty and love that we encounter in the kitchen, at the table, in fellowship and in the world around us. Ha! Don’t you love just the idea of carrot cake? Why not replace some of the other moisture for a cake (like oil or eggs or milk) with some nice wet produce? Why not indeed. Anytime you can make something yummy that has produce in it, that’s a plus. And carrot cake is even socially acceptable. You don’t have to lie about what those little orange bits are in the cake. This recipe is a favorite of our Step-Mother and she made it for Little Sis on one of their first evenings getting to know each other – what Little Sis fondly refers to as their ‘first date.’ Here’s to first dates, healthier cakes and parents who are wise enough to bring fabulous new people into their children’s lives. So Step-Mo, also being very generous and wanting to look out for everyone, wanted Mr. Bigg Sis to be able to eat carrot cake as well, so we went GF and the results were truly delicious. We dusted with just a touch of powdered sugar for looks. The original recipe (from a personal friend) suggested cream cheese icing but this is a sweet cake – I don’t think it needs icing. And it is very moist. We enjoyed this and most of all because it was prepared for and shared with people we love. It’s been a terrific year and we thank you for visiting us here at the pantry. If you are looking for some encouragement and guidance in improving your nutrition and health in the New Year, check out our e-book, Baby Steps to Better Health. Also great to share with a friend or loved one. We wish you all a very happy and safe celebration of all that you’ve experienced, learned and loved this year with high hopes for a healthier New Year marked by peace and love. What to bring or serve for the bread portion of Thanksgiving that is gluten free? Those that eat gluten will probably not enjoy the GF standard version, so usually I supply corn bread or corn muffins to round out the meal for GF and non-GF eaters alike. I have been hankering for my GF Banana Biscuits and was tempted to introduce banana to the Thanksgiving menu despite all evidence that residents of New England have never found a banana anywhere but in a modern grocery store. 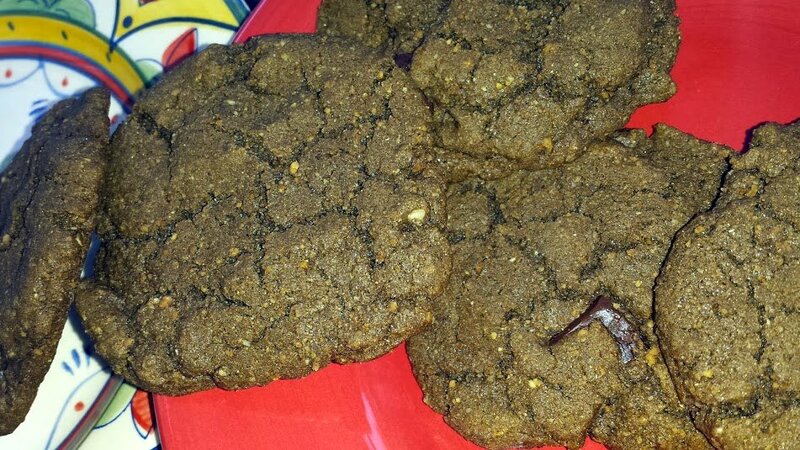 So, in true Little Sis fashion, I decided to just change up a good recipe to create a more appropriately seasonal biscuit. Which of course leads us to pumpkin…. No, not the 4 that are still sitting on my porch in lieu of the Christmas decorations that are already springing up all around us…. I opted for the can of pumpkin in the pantry. 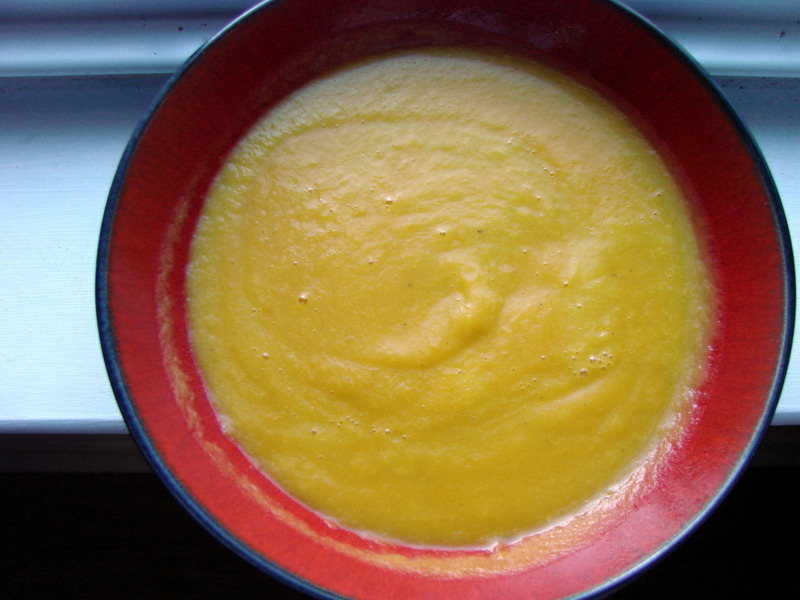 Turns out pumpkin puree makes an easy substitute for banana, add a little sugar (if you like) and voila. 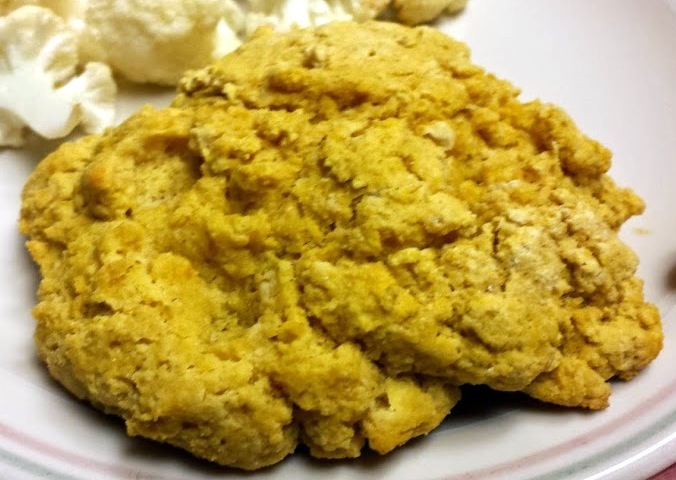 The three of us really enjoyed these biscuits (which I had the sense to test prior to Thanksgiving Day) with our ‘Not Just Kramer’s Mulligatawny’ – Vegan Curry Soup. As an aside, I was inspired to make this delicious soup because I have been horning in on Little Sis’ weekly meal plans. She has kindly published her weekly meal plan for the last 3 weeks (here’s week 1 and week 2) and oooh is it nice to just check it out and make what she picked 😉 She is so smart that Little Sis of mine. I want to be just like her when I grow up. At any rate – back to the biscuits as I’m sure you have plenty to do today! In a separate bowl (or large glass measuring cup), mix the pumpkin and milk. Add the mixed pumpkin and milk and stir to combine but don’t over-mix or mash. Now I just pinched off big pieces and patted them slightly into biscuit shape and laid on an ungreased baking sheet. If you want more uniform biscuits I guess you could roll them out and cut them.